The 10 Best Places for Gelato in Washington State! Enjoy the dense and intense flavors of gelato, whether it’s a fruity combination or a classic creamy chocolate. In Washington State, you’ll find some of the best. Make sure to sink your sweet tooth into this delicious and decadent treat at these 10 best gelato places in the state! If you’re looking for some of the finest hand-crafted gelato in the heart of Seattle, then look no further! Fainting Goat Gelato has been churning up some seriously succulent treats since 2009. Fainting Goat Gelato crafts each batch daily to ensure high quality and freshness. They use locally-sourced seasonal fruits and only the highest quality nuts. Make sure to grab a scoop on your next visit to Seattle! You can be sure to find the true authentic Italian taste here at D’Ambrosio Gelato in Seattle. They know that the only way to truly fantastic gelato is done slowly and only with natural, high quality ingredients. In fact, D'Ambrosio takes "made from scratch" very seriously. This gelato shop, just as the best of the best do, utilizes organic milk. They make their own base using organic, local dairy, organic cane sugar, and the freshest ingredients available. D'Ambrosio melts down their own chocolate for sauces, and cuts and caramelizes their own bananas. Known for a lovely variety of flavors, from classic Italian flavors like deep chocolate to intriguing ones such as caramel and fig, D’Ambrosio Gelato will keep you coming back for more. They also do catering for celebrations of any kind. Sirena Gelato was the result of a study abroad trip from shop owner Brian. After some tinkering and time, the classic way of crafting gelato with milk instead of cream, the denser churn, and the warmer serving temperature, was brought together to form what is now one of Kirkland and Bellingham’s finest sweet boutiques. Make sure to try some of these perfectly crafted flavors like Turkish hazelnut or Dutch chocolate. According to some customers, the gelato here at Gelatiamo in Seattle is some of the best gelato they’ve tasted since travelling to Italy. The cool atmosphere and the passion for this tasty treat can easily be seen from the shopkeepers. Small batches made with quality ingredients and perfectly executed flavors like pistachio, tiramisu, maple pecan, and crème brulle makes Gelatiamo worth a visit for anyone. As a 2016 Gelato World Tour Finalist and winner of “Best Ice Cream Shop in Western Washington,” two years in a row, the Nutty Squirrel is a definite must try. The fantastic flavors and the warm and friendly service is a perfect end to a dinner date in the city, or a fun romp around town! This family-friendly shop has its own dedicated kid’s space which makes it perfect for those busy families out for the day. Make sure to pay this place a visit. Canarino Gelato Caffé in Edmonds is a cool and sleek place serving up some of the most delicious gelato and sorbetto in the state. Offering over 60 flavors in seasonal rotation, Canarino always has something new and exciting to try out, with flavors like Canarino, chocolate, vanilla, sour cherry, roasted almond, pistachio, tiramisu, there’s something for everyone! Hawley’s Gelato & Coffee in Olympia is a cute and comfortable little gelato shop and café. This locally owned and operated shop serves up amazing gelato and is known for being generous with their portions, friendly with their service, and reasonable with their prices. Make sure to give Hawley’s Gelato & Coffee a taste on your next visit to the state’s capital. According to many customers, Bottega Italiana is the best place to go for gelato in the state and has the best gelato you will ever taste! This sleek and clean gelato shop is located in the heart of Seattle in Pikes Place Market and serves up amazingly delectable tidbits of all sorts of flavors. Medzo Gelato Bar and Travel Café is a cute and cozy gelato bar with a rustic feel. The friendly and warm service and the delectable gelato makes Medzo a must try! They offer a range of 20 delicious and classical flavors for every gelato aficionado! 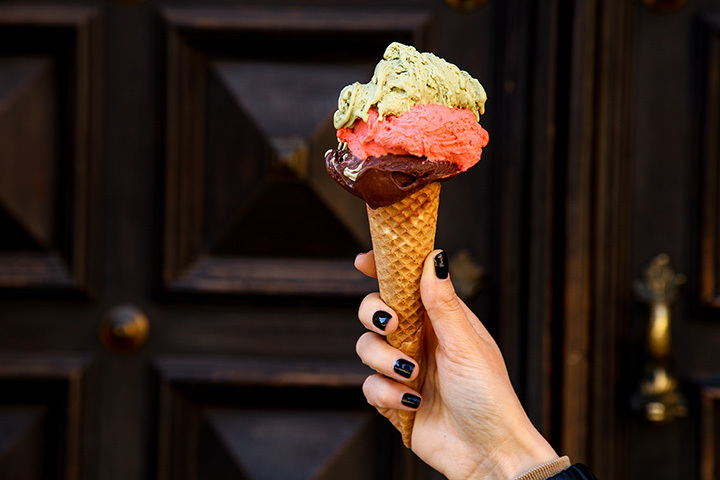 This locally owned and operated gelato bar is a favorite for tourists and locals alike! Vovito in Seattle is inspired by the small neighborhood cafés commonly found in Italy. With that comes the quaint and quiet spaces to relax and enjoy a scoop or two of any combination of classic and new flavors. Offering both gelato and sorbetto, there is no reason not to indulge!